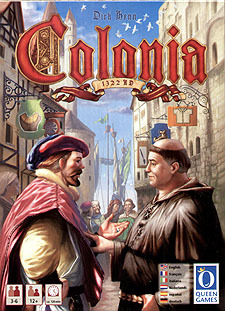 Colonia in the Middle Ages. The largest city of the "Holy Roman Empire" is renowned for its famous cathedrals and versatile trade. Reputable patrician families hold influential positions in the City Council and are in control of the city's fortune. They are always striving to increase their riches and to consolidate their power. Each family wants to be the most influential - but only one may achieve this goal! Colonia is one of Queen Games big box games and you do get quite a bit of stuff in the box. The board is a sort of arch shaped and fits together jigsaw fashion depicting a dockside area with docks, shops, traders, etc. The easiest way to describe what this is about is to do it backwards! The object each round is to buy relics for VPs. To buy the relics you need the right currency and to get the right currency you have to sell the goods using the right ship. You get the goods by providing the traders with the raw materials to make them. The raw materials you get from the market and the market opens after a town council session which determines if any events are going to happen that day. So the game is all about timing by having the right item at the right time to make the most out of what you have to buy those relics. An interesting economic game which is beautiful to look at too. Their is a limited 'collectors edition' but the only difference is that you get wooden meeples instead of cubes for your people.